Place the 3 chicken breasts in a slow cooker, and coat tops with the diced garlic. Pour the can of tomatoes on top. Cook on low for 5 hours. Remove chicken from the slow cooker and pull apart with fork until shredded. Add enough of the tomatoes and juice to shredded chicken to moisten. Set aside. Cut corn from the cobs. Add 1 tbsp butter and corn to small sauté pan and cook for 3 minutes. In a small pan, add black beans. Sprinkle in some of the chopped scallions and heat. Remove from heat. Preheat oven to 350 degrees. 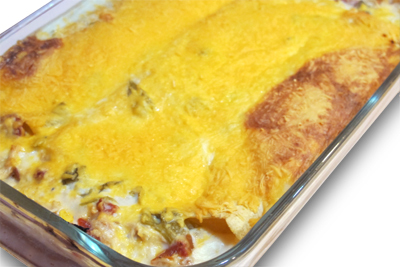 Coat an appropriate-sized casserole-baking dish with non-stick cooking spray. In a flat surface, lay out a soft tortilla shell. Add a line of the Mexican cheese in the center, and then layer on top of that line the chicken, a spoonful of the corn, and a couple tablespoons of the black beans. Bring the right side and the left up and tuck them around the line of ingredients to roll into an enchiladas. Place seam-side down in baking dish. Repeat until you’ve run out of ingredients. I usually have some chicken left over and I sprinkle it on top and around the sides of the enchiladas in the baking dish. In a medium saucepan, melt 3 tbsp butter. Add the flour and mix together while heating. Add the chicken broth and with a whisk, mix while it heats. When this thickens and bubbles, quickly add in the sour cream and green chilies. Mix and remove from heat. Pour over the enchiladas. Top enchiladas with the medium cheddar cheese and bake for approximately 30 minutes, or until cheese becomes bubbly and starts to brown around the edges of the baking dish.